I love trying new bath and body products, especially when they're from a brand that I already trust and love. 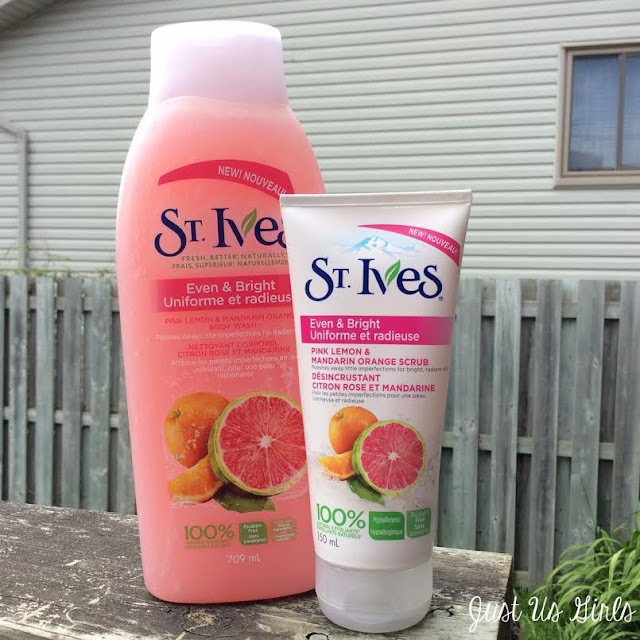 So when I heard about St. Ive's Even & Bright Pink Lemon and Mandarin Orange scrub and body wash, I knew I had to try it. With Summer being around the corner and the weather warming up, I love using products in the shower that smells both fresh and clean. I already use their Apricot face scrub. I've been using it over a year now and so there was no doubt that I would love the Pink Lemon and Mandarin Orange Scrub. What I love about this scrub is how when you apply it on your face it goes on smooth, It first feels like lotion being applied and once you rub it in to clean your face and rinse it off, your face feels fresh, clean and smooth. It's made with 100% naturally derived exfoliants and is made to polish away little imperfections for bright, radiant and more even-toned skin. After using the Pink Lemon and Mandarin Orange body wash, I can tell you that it's now one of my all time favorites to use in the warmer months of the year. Not only does it lathers up great when applied, you'll feel like you've been given a burst of energy from the smell of the citrus scent. I love the feeling of feeling fresh and clean when getting out of the shower and this does just that. Both the scrub and body wash are formulated without parabens, hypoallergenic, dermatologist tested and retail between $5.19-$7.49 at stores near you. For more information about the new Bright Pink Lemon & Mandarin Orange products and other St. Ive products be sure to head to www.stives.ca. Disclosure: All opinions are my own. I received the above mentioned St. Ive's products at no cost for the purpose of this review. No other compensation was received.